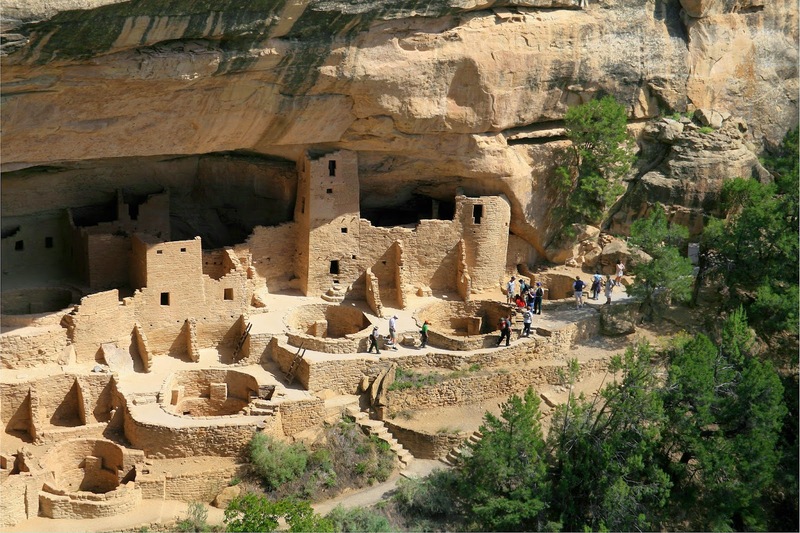 Mesa Verde National Park is located in southwest Montezuma County, Colorado in United States. It is one of the largest archaeological preserve which has been listed as UNESCO World Heritage Site. It was named as the `Number One Historic Monument in the World by Conde Nast Traveler and National Geographic magazine called it`one of the 50 Places to visit in a lifetime’. Its canyons were created by erosion from the receding ancient oceans as well as waterways resulting in Mesa Verde National Park elevations that ranged from around 6,000 to 8,572 feet being the highest elevation at Park Point. Now the terrain in the park is a transition zone between the low desert plateaus as well as the Rocky Mountains. The park was created by President Theodore Roosevelt in 1906 to protect some of the well preserved cliff dwelling in the world or according to him to preserve the works of man. Mesa Verde National Park seems to be the only cultural National Park which was set aside by National Park System and covers an area of 81.4 square miles towards the Four Corners, featuring numerous ruins of homes and villages that were built by the Ancient Pueblo inhabitants, known at times as the Anasazi. One will find over 4000 archaeological sites with over 600 cliff dwellings of these people at the site. Mesa Verde is known for its cliff dwellings that are structures built with the caves and beneath outcroppings in cliff which include the Cliff Palace. This is considered to be the largest cliff dwelling in North America. The term Mesa Verde when translated into English from Spanish means ‘green table’, which is considered to contain some of the best and notable preserved archaeological sites. The structures within these alcoves were of blocks of hard sandstones which were held together and plastered with adobe mortar. Specific constructions were often similar though they were generally unique in form due to individual typography of various alcoves along the canyon walls. The cliff dwelling of Mesa Verde was a contrast to the earlier constructions and villages on the top of the mesas, reflecting a region wide trend towards the growing regional population into close and defensible quarters during the AD 1200 era. The structure here showed a trend of the inhabitants that moved towards time masonry techniques on former jacal wall which were commonplace in architectural design. Mesa Verde National Park offers the tourists glimpses into the lives of the Ancestral Pueblo people. Scientist has done research on the ancient dwellings of Mesa Verde by making comparisons between the Ancestral Pueblo peoples and their contemporary indigenous descendants who continue to live there. There are twenty four Native American tribes in the southwest who have ancestral affiliation with the sites at Mesa Verde. The entrance of the Park is nine miles east of Cortex and 35 miles west of Durango in South-western Colorado on the US Highway 160. One can schedule a day or two to explore and enjoy the beauty of Mesa Verde National Park and experience the world class archaeological sites with the beautiful canyons and plateaus of Mesa Verde Country.